COMPASS / PRIYOMBODO movement of stock price index (CSPI), which has strengthened in the early trading session I observed from a monitor in the Indonesia Stock Exchange in Jakarta, Monday (18/06/2012). Positive sentiment from the Greek elections made ​​earlier in the week to trade stock index closed up 42 046 points (1.10 percent) to a level of 3860,155. 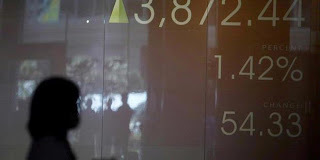 JAKARTA, - Composite Index opened higher around 18.370 points or 0.45 per cent to a level of 4038.043 on Monday (7/16/2012). The gains came after the Asian regional stock indexes opened higher, but then tend to move varies. Opened the LQ45 index rose 4.736 points (0.68 percent) to a level of 691.916. Entering a five-minute trading, stock index rose 24 points (0.61 percent) to a level of 4043.206. U.S. stocks closed sharply higher on Friday trading (07/13/2012). Dow Jones index jumped 203.82 points, or 1.62 percent, the S & P 500 rose 1.62 percent and the Nasdaq gained 1.48 percent. The rally is supported by reports of the performance index JP Morgan that exceeds expectations. Although rising, the investor must be aware of the variation of the index in Asia this morning. Japanese stocks off today. Shanghai Composite Index dropped 7.24 points (0.33 percent) to a level of 2178.66. Hang Seng Index fell 6.97 points, thin (0.04 percent) to a level of 19085.66. Korea's Kospi index was also down 3.74 points (0.21 percent) to a level of 1809.15. Only the Straits Times Index rose 7.32 points (0.24 percent) to a level of 3002.88. Diposkan oleh http:// alhasyi.blogspot.com di 9:14 p. m.